Strong winds and heavy rain are expected to hit the county throughout the course of today (Sunday, September 23). According to the Met Office there will be persistent and often heavy rain clearing eastwards by early afternoon. It will feel cool due to the wind, which is expected to strengthen later with perhaps the odd shower. The maximum temperature is expected to 14°C. Tonight the Met Office said there will be isolated showers clearing with long clear spells for most areas. Winds are expected to become light. But it will be turning cold in many parts of the county. The minimum temperature is expected to be 3°C. Tomorrow (Monday, September 24) it is expected to be a mostly sunny day, with some cloud building up in the afternoon. Winds are expected to remain light, according to the Met Office remaining on the light side, with a maximum temperature of 16°C. The outlook for Tuesday (September 25) to Thursday (September 27) is expected to be dry with light winds and plenty of sunshine. Some parts of the county are expected to have some chilly nights. 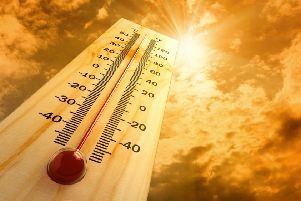 Temperatures during the day are expected to rise, particularly on Wednesday (September 26) and Thursday.